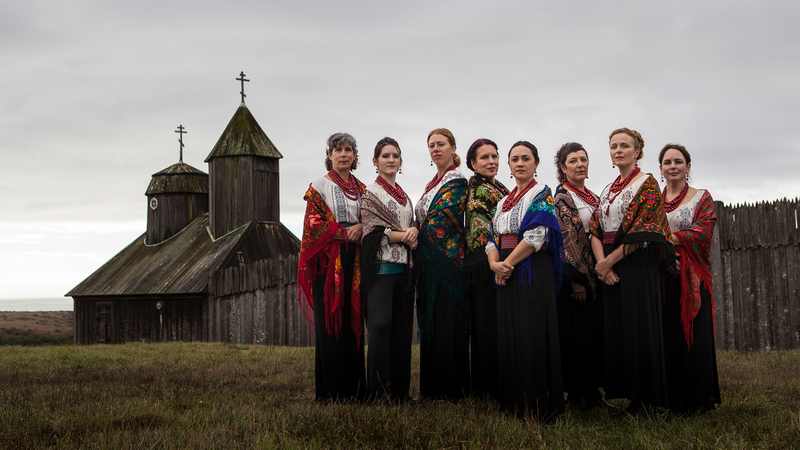 Kitka Brings 'Powerful Women's Voices, Joined Together' From East To West For four decades, the Oakland ensemble Kitka has sung intricate harmonies from Eastern Europe. Members Shira Cion and Kelly Atkins talk about the group's new album, Evening Star. For four decades, the Oakland ensemble Kitka has sung intricate harmonies from Eastern Europe. Members Shira Cion and Kelly Atkins talk about the group's new album, Evening Star. GARCIA-NAVARRO: The album "Evening Star" features harmonies unique to Balkan, Slavic and Caucasian lands. But here's the twist - they're served up by Kitka, a vocal ensemble of many years standing based in the San Francisco Bay Area. Shira Cion is the group's artistic director. She joins us from the studios of KQED. Welcome. SHIRA CION: So great to be here, Lulu. Thank you. GARCIA-NAVARRO: Also with us is Kelly Atkins. She's another Kitkat - I think that's what you call yourselves, right? KELLY ATKINS: It is, yes. Hi. GARCIA-NAVARRO: Hi. Shira, I'm going to start with you. You're quoted in the press notes saying this music springs from a, quote, "instinct to come together and sing in the deep, dark heart of wintertime." I love that, by the way. Does this music help bring up the body temperature? CION: They actually think it probably does. And it's been interesting. You know, so many studies are now coming out about sort of the physical and cognitive and social benefits of harmony singing and choral singing. And I think all the science is just proving something that Eastern European villagers have known for centuries, which is that when times are tough, when weather conditions are cold, where merely surviving through a difficult season really calls upon communities to come together, it's a time to sing. And I think singing does lift spirits. It does sort of synchronize our organisms together. I really do believe it helps us survive through trying times. GARCIA-NAVARRO: Kelly, that image of the deep, dark heart of wintertime is also a metaphor, I guess, of the kind of music that this is. Tell me what - how you see it. ATKINS: Well, we also use the metaphor of the cycles of life. Some of the songs, as you probably noticed, from the album are literally about winter. And some of them are about the winter of life. So we kind of see a lot of the songs that we sing not only about the holidays themselves but about the cycles that we go through in our own lives. GARCIA-NAVARRO: Let's listen to a bit of the title track. It's a Bulgarian song - "Evening Star." GARCIA-NAVARRO: I got to tell you, it feels like something deeply thrumming and ancient. You know, it comes - it really comes from this sort of essential place. It really does. It's amazing. Kelly, I understand you have a background as an indie rocker. What got you interested in Eastern European vocal music? ATKINS: Well, the first time I saw the Bulgarian Women's Choir, I was at Grace Cathedral. And I sat in the pews and just wept. And I couldn't figure out what was happening to me. And it just rocked me on a very, very deep level. So I think that was my gateway drug, as we call it in the group. Most of us have our gateway drug of Bulgarian choir music. GARCIA-NAVARRO: ...The music so irresistible to female vocalists? CION: Well, I think for those of us who I would say identify as liberal American feminists, there's something about the quality of powerful women's voices joined together in this very physical, very close harmony, sometimes dissonant harmony configurations that really appeals to a contemporary American female sensibility. KITKA WOMEN'S VOCAL ENSEMBLE: (Singing in foreign language). CION: The solo artist. And this is really a communal form that can really only take flight when there's a community of people participating in it. GARCIA-NAVARRO: Let's listen now to a Ukrainian carol from your album. KITKA WOMEN'S VOCAL ENSEMBLE: (Singing in Ukrainian). GARCIA-NAVARRO: So this is actually a Ukrainian carol for New Year's. And you actually traveled there a while back and met up with a Ukrainian group. What about your other travels to perform in Eastern Europe? What's been the reaction from audiences? ATKINS: We were in Serbia about - was it five years ago? ATKINS: And it was my first time with Kitka traveling abroad and singing Serbian music to Serbians. And I honestly was nervous going. I was thinking, who am I as an American to go and sing these songs in front of these people where, you know, they have these deep roots with these songs? But in fact, we were received very warmly. And it was really a cathartic experience for both the audience and for us. GARCIA-NAVARRO: So, Kelly and Shira, this is to both of you. What's your favorite song on the album? CION: Oh, that's a tough one. CION: What do you think about maybe "Blazentsv"? CION: Yeah. This isn't technically a winter song. But it's a song that we feel articulates qualities that we all try to summon in ourselves during the holiday season. It's a musical setting of "The Beatitudes" by the Russian composer Vladimir Martynov. And, you know, these are calling the listener to embody qualities of generosity and compassion and kindness, living simply so that others might simply live and seeing that true contentment really comes from kind of going against the grain of greed and egoism and materialism and violence and living gently, living kindly so that others can feel the kingdom of heaven here on Earth. GARCIA-NAVARRO: That is a good holiday message. Shira Cion and Kelly Atkins from the Kitka Woman's Vocal Ensemble. Their new album is called "Evening Star." Thank you both very much. CION: Thank you so much for having us. KITKA WOMEN'S VOCAL ENSEMBLE: (Singing in Russian).